“Play!,” our young granddaughter commanded this morning, grabbing my hand and tugging. And I obediently (and gladly) followed into the play room. “Sit!,” she ordered (pronounced “seet”), pointing to the floor beside her, and I do so, even though I know that getting up from the wood floor will be a heroic challenge given my decade count and sad sack back. And we “cook” plastic eggs and burgers in her play kitchen or dress her dolls (some that once were her mom’s) or encourage her as she chooses letters and numbers on her electronic learning desk or bring to life with my famous impersonation her Hulk Hogan stuffed doll that was her daddy’s and with whom I made my version of Hulkie’s voice famous (as I did with her daddy’s younger brother, now exalted and beloved Uncle Corey). For 2+ years, I have been an ecstatic and doting grandpa and sometimes caregiver for Theresa Nell, who has lived a short and often-taken two-hour drive south of us, but this month and this week, our new reality is soon to be two-plus-hour flights to a new state as Theresa Nell and our oldest son and daughter-in-law head on a wonderful adventure with great new jobs and a life out West. I could be neither happier nor more heartbroken as this transition plays out. I remember and appreciate when in 1981 I left a town where few relatives since 1620 had ever left. And my mother, obviously not a happy camper, did not nag me or make me feel guilty as I told her I was leaving, surprisingly for the grande dame of drama and guilt. But I figured she was if nothing else happy about her future vacation hostelry for years to come in that my destination was Florida. It became home for 18 years and after that, Illinois has been for another 20. I admit I almost had to pull off I-57 this morning twice because tears clouded my vision as I headed back home after saying goodbye to the three on their front stoop in Champaign, in the same spot where I took the picture of eldest two of them four years ago when they bought the house. Obsessive that I am about photos, I asked them to pose with their beautiful +1 as they did four years ago solo. They did, bless them. 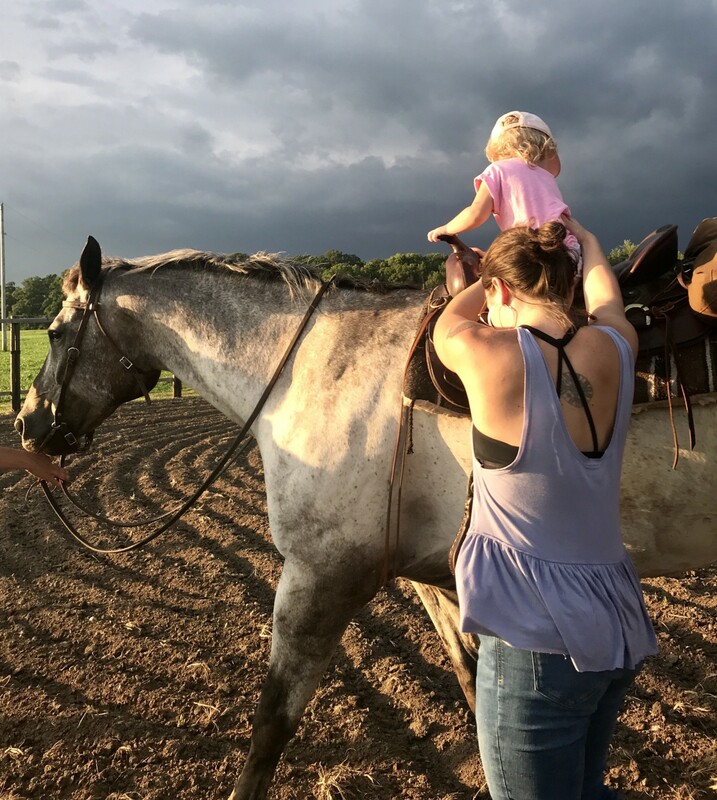 The photo above is T a week ago when I was also down there when she was introduced to horseback riding, a love of her mom’s and something that last weekend shows T is a natural at. Lots of horses where they are moving, which is perfect. This morning, as we were looking at photos on my iPad, T reminded me with a perfect impersonation of the pained forlorn whinny that the thoroughbred who was left in the stable gave over and over when T rode on an Appaloosa named Story last weekend. Into the sunset John, Casey and T ride, I guess; but it really is into the sunrise. This week, I head for a visit to the hometown I was a rarity in leaving, to see my sibs, and then a week after that head out to help care for T as her daddy and mommy settle into new jobs in their new hometown and the days count down to her new day care school being open. My heart is heavy, yet full. The sun also rises, Hemingway taught us.